How to stop the search and exit the application while search in progress? 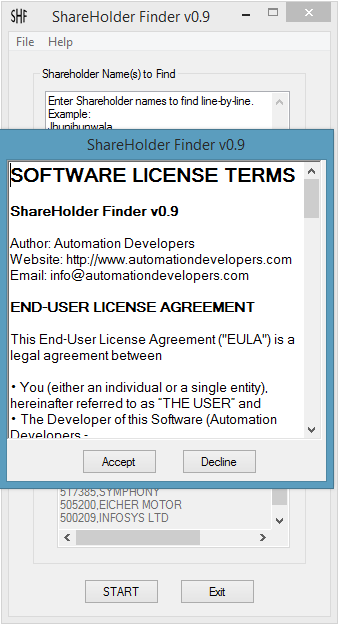 Download ShareHolder Finder v0.9 Software. Copy ShareHolderFinder.exe to a folder. The application will be launched as shown below. It displays the Software License Terms window, initially. Read through the license terms and Accept it to continue using the software. Enter the shareholder name(s) to find here. Multiple names can be entered line-by-line. Quarter from June 2016 is available. New quarters will get added automatically and the default quarter is the latest one. The software can automatically get the latest BhavCopyfrom BSE website and collect the company list. Note: BhavCopy is a list of traded securities on an Indian Exchange. It generates daily. 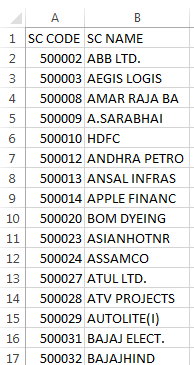 A Microsoft Excel file with company list can be selected here. The company list should be provided as shown below. There should be two columns for BSE Script Code and Script Name. There should be a header row with names SC CODE and SC Name. Full list of Active securities as of 18thFeb17 can be downloaded from here and use. The latest data can be obtained from BSE website also. User can directly input the company list. Input the BSE Script Code and Script Name separated with a comma. Click “START” button to start the analysis directly. Click “Exit” button to exit the application. Output HTML Report will be auto-launched in the default web browser, immediately on clicking the “START” button. The HTML Report is updated in run time and “Refresh” the web page to view the run time results. A separate report file will be generated for each analysis and the file is stored in “Results” folder with naming format “ShareholderFinder_Results_YEAR_MONTH_DATE_HOUR_MINUTE_SECOND.html”. A message box as shown below will be displayed on successful completion of the analysis. 4. How to stop the search and exit the application while search in progress? Right click system tray icon and select “Exit” option. A confirmation message will be displayed as shown below. Select “Yes” to stop the operation and exit the application. Selecting “No” will resume the analysis. Note: HTML report will not be auto closed on exiting the app. Please close it manually. Some False Positive reports occasionally pop up in different antivirus products in conjunction with this software. This is partially due to the compression and portability techniques used and partially due to a failure of some antivirus companies to fully test their virus definition updates before sending them out to users. If you encounter a false positive, you may add the executable to your antivirus exclusion list and try again. Alternatively, you may inform your Antivirus Company regarding this false positive and wait for them to update their virus definition. If you need any specific details on this, please feel free to write to us @ info@automationdevelopers.com.